Mirabella ministry visits churches in several regions in most districts in Tamil Nadu and around the world for prayer meetings, large gatherings, private gatherings, visitation to churches. Mirabella's exclusive music band travels along with its volunteers throughout Tamil Nadu and international locations like Singapore, USA, Israel for deep spiritual experiences. All the young people who have joined our youth ministry have unique stories to tell. From different families, these youths, after being anointed in the prayer meetings, decided to dedicate their lives to serving God. God has blessed these youth with special talents from being able to play different instruments to leading worship. Every week, they travel along with Sr. Caroline, to a countless number of churches and repay God with their gifts by singing, leading praise and worship, playing music, praying for everyone who attends the meeting, giving counseling, and much more. The Teen Ministry follows in the footsteps of the youth ministry, as they are younger. Even at such young ages, they have decided to serve God and give God all that they can. They sing and play instruments as well. The youngest ministry is our Baby Ministry, who were set apart before they were even formed in their mother’s womb! (Jeremiah 1:5) God has showed these babies his love in a special way that these babies were born to glorify our Lord. Access, Subscribe and Print our Mirabella Google Calendar. 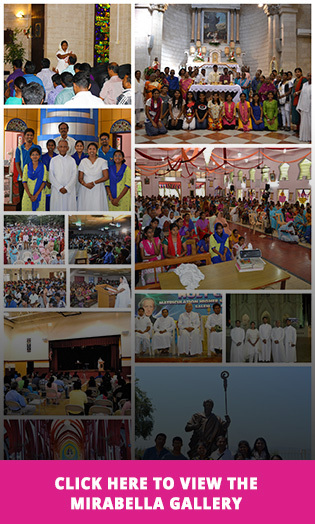 The Ministry has events throughout the year. You would like Mirabella to come to a church in your town, click here to provide us all details about yourself and your church. If you are interested to attend a prayer meeting and would like to be notified when we arrive in your town, click the below link. Click here to provide your details!